Film director David Lynch ("the Elephant Man," "Mulholland Drive" "Twin Peaks") is a well known meditation enthusiast and decades long practitioner. Now the enlightened auteur is turning philanthropist and donating a whopping $1 million towards a scholarship fund for students looking to learn transcendental meditation at the Maharishi University of Management in Fairfield,Iowa. 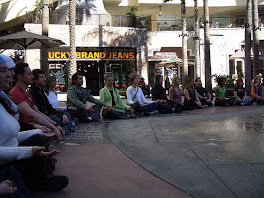 The hope of the move, is to increase the overall number of students practicing meditation on the Fairfield campus that also teaches undergrad and grad courses in everything from computer science to sustainable living. "America urgently needs at least one university to teach the science of peace — and to actually promote peace in the world," the filmmaker said in a statement Thursday. The university will host "David Lynch Weekend" on April 25-28, featuring performances by Donovan, Moby and Chrysta Bell. A laudable gesture, but let's hope it's better thought out than this ill-advised event!